New Blog Series: Sample Saturday! 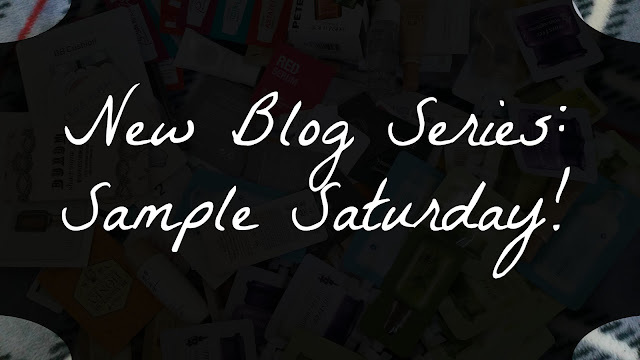 We have been thinking about this for a while now and we finally decided to launch our new blog series: Sample Saturday. This will be a bi-weekly series, so there will be a mini review of a sample product in our stash every other Saturday. We decided to do this because we have gotten quite a lot of samples from our various purchases, gifts, etc. Samples are a great way for us to decide if we want to purchase the full size item or not. So, we like to subject them to the same trials as a full size item. We already have quite a lot of samples in our stash but not every sample will get a review for Sample Saturday. The reason being that we will purchase full sizes for some of these samples, so we want to save our reviews until after the full sizes. Some of Sample Saturday's reviews will also be a bit different than a review for a full size product. This is due to the fact that we have limited supplies of each sample, so, sometimes we can only share the basic information such as texture, scent, color, and our first impressions. We won't have enough for some samples to do long trials. For samples that we have quite a few of for longer trials, we'll be sure to test them and share our findings with you all. We hope you look forward to our new Sample Saturday series! The first post is tomorrow~ See you then!